The first violin part for the Overture from Mozart's The Magic Flute, K. 620 has been edited by Ilya Kaler, who has appeared as guest concertmaster with the San Francisco Symphony, Philadelphia Orchestra and Baltimore Symphony. Kaler's bowings, fingerings and other editorial markings have been added throughout the score. The Magic Flute (Die Zauberflöte) is a two-act opera composed by Wolfgang Amadeus Mozart and based on a German libretto by Emanuel Schikaneder. The opera was the culmination of a period of increasing involvement by Mozart with Schikaneder's theatrical troupe. It was also an example of the popular dramatic style known as Singspiel, a blend of singing and spoken text. Although Mozart started it before La clemenza di Tito, The Magic Flute was the last opera Mozart completed. It premiered in 1791, the same year of Mozart's death, at Schikaneder's theater in Vienna. 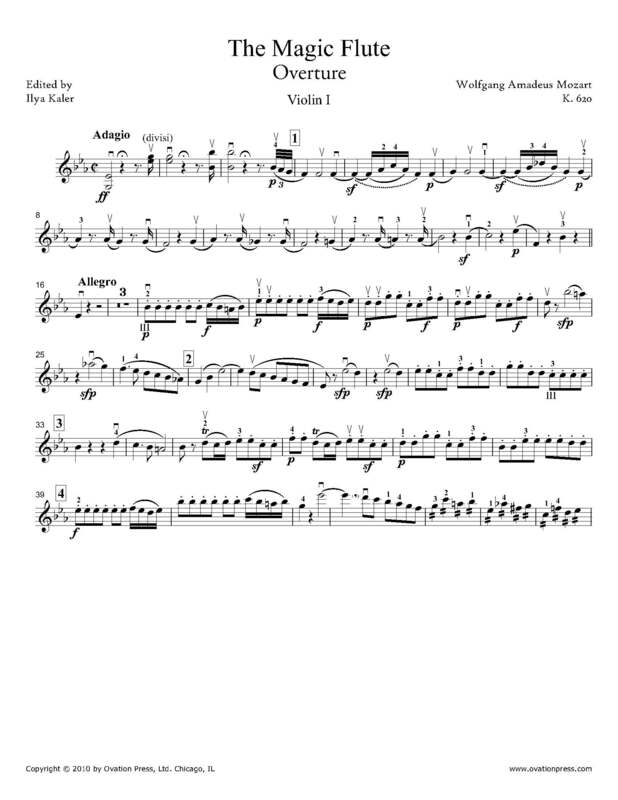 Download and print the score today to gain access to expertly edited Mozart The Magic Flute Overture violin fingerings and bowings from Ilya Kaler!